Jakarta, Dec 8th 2016 - The first ever Harper Hotel by Archipelago International in Jakarta is opened in 2016. Following the success of the already-established Harper Kuta - Bali, Harper Mangkubumi - Yogyakarta, Harper Purwakarta, and Harper Perintis - Makassar, the brand new and stylish hotel Harper M. T. Haryono is opening its doors in Cawang, one of the busiest business districts in Jakarta. Offering easy access to Halim Perdana Kusuma Airport and the Dock Shipyard, Harper M. T. Haryono is located near to the Toll Road that connects Cikampek, Bogor and Bandung. The modern hotel is infused with a rustic charm with a cozy, comfortable and residential feel thanks to an interior design that plays with homely, warming hues. 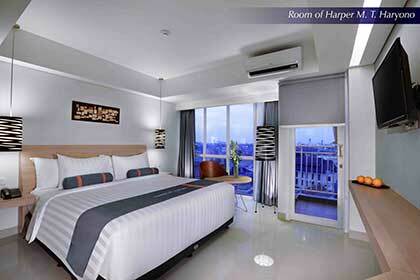 The hotel combines both comfort and functionality for both leisure and business travelers. The 131 rooms are fitted with 100% cotton duvets and linens and super soft beds available in Superior, Deluxe, Junior Suites, and Suite rooms. Each room is then fully furnished with en-suite bathrooms and amenities, vanity mirrors, wardrobes, self-controlled AC, writing desk, and coffee & tea maker. LED TVs with 60 local and international channels, IDD telephones, and free Wi-Fi throughout the hotel are also provided to ensure guests are kept connected and entertained whilst unwinding in the comfortable rooms. For leisure travelers, the cultural area of Taman Mini Indonesia Indah (TMII) is just 30-minutes' drive away from Harper M. T. Haryono, whilst the Pusat Grosir Cililitan shopping center and Padang Golf Halim can be reached within 15 to 20-minutes. The Jatinegara Railway Station is also located near to the hotel, offering easy access for travelers who want to explore Jakarta or the surrounding cities such as Bekasi and Bogor. Harper M. T. Haryono also offers an outdoor swimming pool and in-room massage services for both leisure and business travelers looking for down time. When it's time to work, Harper M. T. Haryono brings the best MICE facilities to Cawang area with one ballroom and four meeting rooms that can accommodate up to 500 people. The signature Rustik Bistro and Bar then offers a wide range of delightful dishes for breakfast, lunch and dinner. Besides being fully equipped with a host of thoughtful amenities and facilities, the hotel also offers quality services ranging from front desk concierge, airport transfers, mail and postage services and even car rental. For the utmost security, the front desk, security guard and CCTV are on hand 24-hours a day. "Our Harper brand is the youngest in our portfolio, yet its success story is comparable to some of our strongest brands. Jakarta has established itself as a thriving destination for travelers, and we are excited to respond to this rising demand by opening our first Harper hotel in this bustling city. With Harper’s focus on the bringing the pillars of well-being to life and commitment to ensure our guests leave feeling better than the time when they first arrive, we are confident that the opening of the hotel will resonate strongly with the local Jakarta community and guests visiting from around the world," said John Flood, President and CEO of Archipelago International.